If someone told you that watching TV or movies in colour was a waste of time, and that black and white is perfectly acceptable, what would your response be? For one, you’d wonder what century they were from? We all know that colour is the standard that everyone expects, and has been for decades. To suggest it’s not necessary is simply absurd. Surprisingly some real estate “marketing experts” suggest that print marketing is not necessary for your property. Really? I’m curious to know what marketing research that is based on? If it were true, then why do the largest estate agencies spend so much on print marketing? It’s not for boasting rights, I can assure you. The reality is that, even though print marketing is by far the largest expense that a real estate company has, it works! 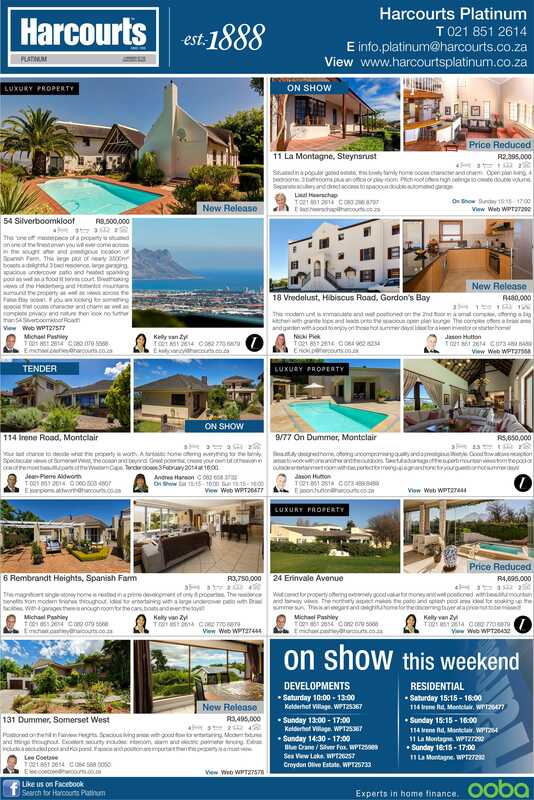 It works because in South Africa – and in most property markets in the Western World – buyers still search for properties in the printed media. What has changed in the last 20 years is that buyers also use the Internet to search for properties. The Internet and property websites are powerful tools to showcase properties, with additional photo’s, floorplans, videos, and detailed information. Every estate agency serious about selling real estate will definitely list all their properties on the Web. But that doesn’t mean that print advertising isn’t necessary. On the contrary, print marketing is a very powerful way to drive potential purchasers to websites. At Harcourts we can track the individual number of views on our website listings. Without exception, every time we advertise a property in print we see a spike in our website views on those specific listings. Dropping print advertising is as naïve as dropping Internet advertising. It’s simply not an “either / or”. In fact, to ensure your property receives maximum exposure and attracts all the buyers, you need all forms of marketing to be used. These also include showhouses (where properly advertised), For Sale boards, marketing to a database of buyers, property flyers, floorplan presentations and video marketing. Estate Agents have access to more marketing tools and methods than ever before. Why would you willingly exclude any of them? It would be like asking a surgeon to exclude some of his surgical instruments from the operating theatre to reduce the cost of your operation. Somehow it doesn’t make sense…. These different marketing methods appeal to different buyers. What we do know is that many buyers who enquire off print marketing have a very strong emotional interest in the properties they enquire on. When a buyer has a strong emotional interest in a property they usually make their best offer to purchase it. And isn’t that what a seller wants? The best offer in the marketplace? So, the next time an estate agent suggests that print marketing isn’t necessary to sell your property, consider how you’d feel exchanging your flat screen TV for a black and white tube set! Previous Post What Do You Want From Your Estate Agent? Next Post Preparing My Property For Sale?